Use promo code equinox241 to get Two (2-day) Passes for the price of one! Join us LIVE OR LIVESTREAM for this highly interactive celebration of the sacred Spring Equinox. Live Streaming 2-day pass: $77. Click though above on MORE DETAILS for access. The universal energy on this day is palpable as millions of people from around the globe rejoice on this day. Spiritually-inspired people from many different countries will gather in sacred places to greet the rising sun of the equinox. To some, it is the official first day of the spiritual new year! In ancient times, entire temples were designed around the rising sun of the equinox! The collective energy of millions of people all celebrating at once will cause a powerful shift into unity consciousness worldwide. That's why it is worth doing this in the middle of the week at one of the most sacred sites on the planet. You can come the weekend before and spend time enjoying all of the sacred sites and powerful vortexes in this magical mystical red rock paradise. Book ahead for great rates on hotels or Air BnB's! Southwest and Frontier airlines still have great deals as well. Drive, fly or teleport if you have to but don't miss this earth-shifting, life-changing event! This highly interactive event is focused on teachings and practices that dissolve separation and create greater unity. Together, we will set a group intention to create a greater sense of empathy and oneness that extends beyond the group and spreads across the entire globe. 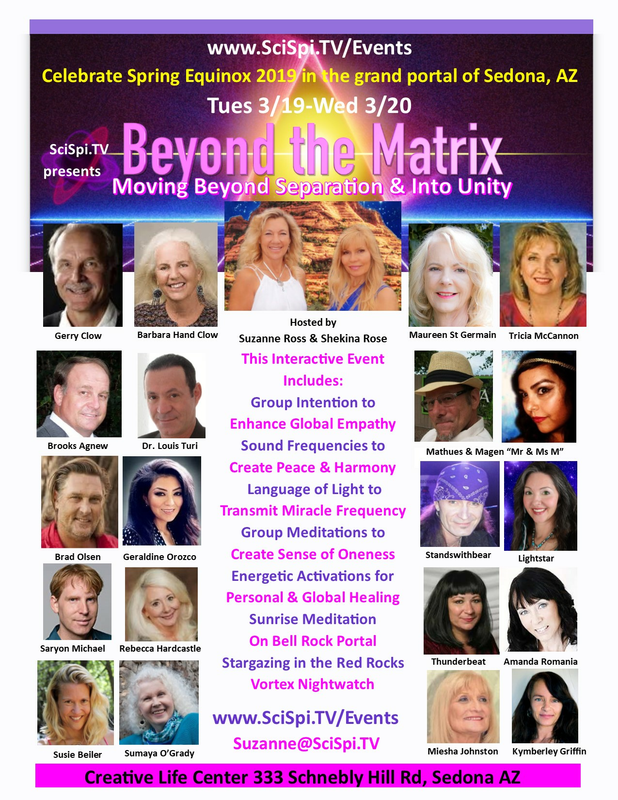 Applying the teachings and techniques offered by the presenters, we will learn how to create and emit higher frequency waves that not only create personal healing but radiate outward to heal others. Raising the group energetics will also enhance our ability to do this individually and collectively. With sound frequencies created by crystal bowls, the flute, the didgeridoo and the Language of Light, the participants will experience an enhanced ability to create miracle manifestation and healing in their own lives and in the lives of others. Doing this during the Spring Equinox will greatly enhance the experience as the universal energies are resonating at a much higher frequency on this sacred day due to millions of people from all over the world rejoicing all at once and also due to the increased resonance created by this solar alignment. 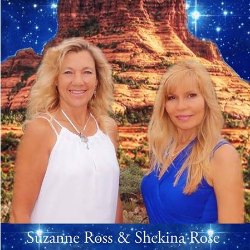 Inspirational author, speaker and TV & radio personality, Suzanne Ross, is hosting this event with co-host, Shekina Rose, who will sing in the Language of Light. Many best-selling authors including Barbara Hand Clow, Maureen St Germain, Tricia McCannon and Brooks Agnew will be offering transformational teachings and powerful spiritual practices. The amazing Dr. Louis Turi will put us in a light hypnotic trance so we can access our superconscious minds. Geraldine Orozco is well-known for her profound knowledge of the human soul and DNA synthesis. She will offer a powerful DNA activation. Magen and Mathew, Mr. and Ms. M will give an update on the global sovereignty movement, global reset and cryptocurrency as well as activating creation codes and offering psychic insight. Sumaya O'Grady will offer a violet flame transmission, Kymberley Griffin will play the crystal bowls and Susie Beiler will play the Didgeridoo. Lightstar will offer galactic guidance and speak in several different galactic languages. Standswithbear will talk about Holographic DNA Restructurization and play the flute. Saryon Michael White is a world-renowned spiritual teacher and author who will guide a sunrise meditation on the grand portal of Bell Rock. Bestselling author of Akashic Therapy, Amanda Romania will be offering insight about making powerful cosmic connections. Recording artist and Energy Worker, Devara Thunderbeat, will offer teachings and transmissions to activate higher codes of consciousness. CEO of the Insititute for Exoconsciousness, Rebecca Hardcastle, Ph.D., will talk about the power of co-creating with our galactic families. Meisha Johnson and Tana Newberry will offer a VORTEX Nightwatch for stargazing and calling in spacecraft on the red rocks. VIP passes are available for the Sunrise Meditation on Bell Rock and the Dinner & Mingle with the Stars. There is very limited seating for both activities so reserve your space early.